OSTROVIT VITAMIN D3 K2. - La vitamina K contribuisce alla normale coagulazione del sangue. - La vitamina K aiuta a mantenere le ossa sane. - La vitamina D aiuta a mantenere ossa e denti sani. 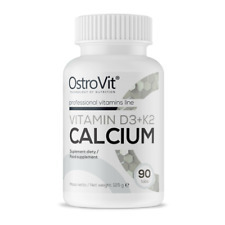 OSTROVIT VITAMIN D3 K2 CALCIUM. - La vitamina K contribuisce alla normale coagulazione del sangue. - La vitamina K aiuta a mantenere le ossa sane. OSTROVIT VITAMIN D3 K2 SOFTGELS. 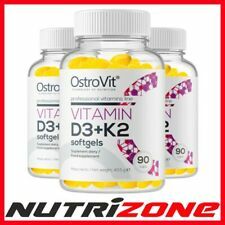 OSTROVIT VITAMIN D3 K2 SOFTGELS. Hit dose of 2000 IU D3 100μg K2. Supports muscle & immune system. Vitamin K 2 also exhibits hormonal action. K2 (MK-7) 100 μg (133% ). OSTROVIT VITAMIN D3 K2. Vitamin D contributes to the normal function of the immune system and normal absorption/utilisation of calcium and phosphorus. IMPROVES ABSORPTION OF CALCIUM & PHOSPHORUS. Do not use other preparations with vitamin K or D. Children, pregnant or nursing woman must not take the product. OSTROVIT VITAMIN D3 4000 K2. Vitamin D contributes to the normal function of the immune system and normal absorption/utilisation of calcium and phosphorus. Immune System & bones Support. Do not use other preparations with vitamin K or D. Children, pregnant or nursing woman must not take the product. TREC VIT D3 K2 [MK-7]. D3 (cholecalciferol). The product contains natural vitamin K and vitamin D that contributes to the normal function of the immune system and normal absorption/utilisation of calcium and phosphorus. 365 compresse Vitamina d3 5000 iu & Vitamina k2 200mcg mk-7 menachinoni - 7 d3 i.e. Vitamin D3 5.000 I.E. & Vitamin K2 200mcg MK-7 = 365 Tabletten - Premium Qualität Laboranalyse (Wirkstoff / Reinheit). 365 Tabletten pro Dose mit Vitamin D3 K2 in einer Tablette, Kombi-Produkt. Vitamin D3 gehört zu den fettlöslichen Vitaminen. 100 compresse Vitamina d3 5000 iu & Vitamina k2 200mcg mk-7 menachinoni - 7 d3 i.e. Vitamin D3 5.000 I.E. & Vitamin K2 200mcg MK-7 - 100 Tabletten (vegetarisch). PREMIUM ROHSTOFFE: Um eine Hohe Bioverfügbarkeit zu gewährleisten wird unser Vitamin D3 schonend aus natürlichem Lanolin gewonnen, somit ist es bestens für Vegetarier geeignet. 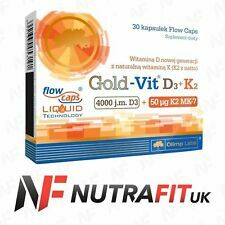 OLIMP LABS GOLD-VIT D3 K2. Vitamin D contributes to the normal function of the immune system and normal absorption/utilisation of calcium and phosphorus. 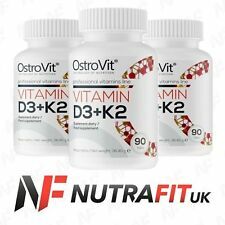 NEW GENERATION VITAMIN d Natural vitamin K.
OSTROVIT VITAMIN D3 K2. The benefits of using Vitamin D3 K2 MK-7 are It is primarily a product that supports your immunity. Vitamin D takes part in the process of cell division. Vitamin K is essential for the proper functioning of the body, contributes to the proper blood coagulation, and also contributes to the maintenance of normal bone mineral density. 360 compresse Vitamina d3 5000 iu & Vitamina k2 100mcg mk-7 menachinoni - 7 d3 i.e. 2x Vitamin D3 5.000 I.E. & Vitamin K2 200mcg MK-7 = 360 Tabletten (vegetarisch) Laboranalyse (Wirkstoff / Reinheit). PREMIUM ROHSTOFFE: Um eine Hohe Bioverfügbarkeit zu gewährleisten wird unser Vitamin D3 schonend aus natürlichem Lanolin gewonnen, somit ist es bestens für Vegetarier geeignet. 3x Vitamin D3 5.000 I.E. & Vitamin K2 200mcg MK-7 = 540 Tabletten (vegetarisch) Laboranalyse (Wirkstoff / Reinheit). PREMIUM ROHSTOFFE: Um eine Hohe Bioverfügbarkeit zu gewährleisten wird unser Vitamin D3 schonend aus natürlichem Lanolin gewonnen, somit ist es bestens für Vegetarier geeignet. Es ist MCT-Öl aus 100% Kokosöl in Premium Qualität. Eine einfacher Aufbau und eine Aufrechterhaltung des Vitamin D3 Levels ist somit möglich. Pro Natural Vitamin D3 flüssig sind 1850 Tropfen in einer wiederverschließbearen 50 ml Flasche. OSTROVIT VITAMIN D3 K2 CALCIUM. The benefits of using Vitamin D3 K2 MK-7 are Vitamin D takes part in the process of cell division. Vitamin K is essential for the proper functioning of the body, contributes to the proper blood coagulation, and also contributes to the maintenance of normal bone mineral density. Nutrizione SBR: SBR Nutrition, siamo impegnati a migliorare la tua salute e benessere. PROVA gratuita di rischio - la nostra vitamina D3 K2 gocce liquide sono made in USA da un impianto ispezionato dalla FDA. Magnesium is very important to help maintain strong bones and is critical to promoting a healthy vascular system. Includes Calcium, Magnesium, Vitamin K2 and Vitamin D3. In order for calcium to help maintain healthy bones, important minerals suchas magnesium, zinc, manganese and vitamin D3 need to be present so that calcium and phosphorus can be utilised efficiently by bones. 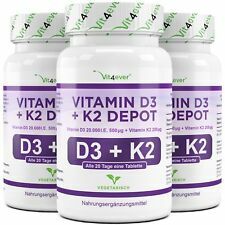 Liposomal Vitamin D3 K2 contribuisce alle funzioni vitali del corpo, tra cui D3 K2 è senza glutine, senza latte, senza zucchero, senza soia, senza OGM, senza additivi. D3 K2, liquido liposomiale può aiutare a sostenere un sistema nervoso sano e la salute cardiovascolare. OLIMP LABS GOLD-VIT K2 PLUS. OLIMP Gold-Vit. The product also contains vitamin D in a dose of 1000 IU. Moreover, vitamin D contributes to the normal function of the immune system and normal absorption / utilisation of calcium and phosphorus. Ostrovit Vitamin D3 K2. Vitamins D and K, like calcium, help maintain healthy bones. Vitamin D takes part in the process of cell division. Vitamin D3 K2. K2 100 μg (133% ). D3 50μg (1000% ). Calcium 1875 mg.